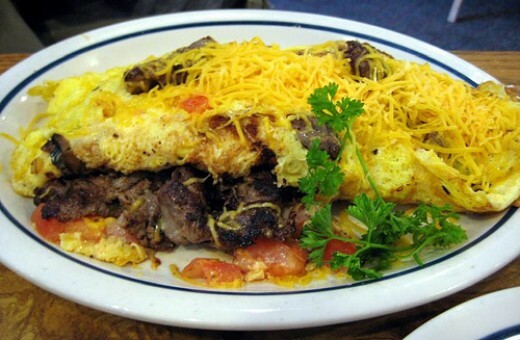 The Big Steak Omelette at International House of Pancakes has strips of steak, hash browns, green peppers, onions, mushrooms, tomatoes and Cheddar cheese. Served with salsa. I just found out that this omelette served in the restaurant has 1490 calories. That's insane. You can lighten up this dish easily by using nonstick spray, egg beaters and low fat cheese. Read on to learn how to make this restaurant food at home in your own kitchen. This steak omelette recipe is so simple and a great way to use left over steak. Saute steak, onions and peppers in a skillet until translucent. Grease a large skillet and preheat on medium. Scramble eggs together with sour cream. Cook eggs until firm enough to flip without tearing. Flip eggs over and turn stove to low. Spread cheeses, steak, onions and peppers over eggs. Fold in half and allow to heat through.